Wang, Y., Sun, Y., and Wu, K. (2019). "Effects of waste engine oil additive on the pelletizing and pyrolysis properties of wheat straw," BioRes. 14(1), 537-553. This study focused on the reuse of wheat straw and waste engine oil by producing pellets with mixtures of the two products. Oxidative thermogravimetric experiments were carried out after blending the wheat straw with different amounts of the waste engine oil additive. Based on the results of these experiments, the effects of additive contents on the pyrolysis properties were obtained. Based on a single pellet unit, experiments were conducted to make pellets from wheat straw blended with the waste engine oil additive under different moisture content, temperature, and pressure conditions. The influences of additive content on the specific energy consumption, pellet density, tensile strength, and higher heating value (HHV) were investigated based on the experimental data. Finally, comparisons were made between the effects of waste engine oil additive and the additives used in other studies. The results showed that the use of waste engine oil additives had few effects on the pellet density but increased the HHV, and decreased the ignition temperature, specific energy consumption, and tensile strength. An effective method to solve the problems of energy waste and environmental pollution caused by burning crop straws in agricultural developing countries or regions is to densify loose raw materials into pellets having high energy density and a regular shape. The densified pellets can be used as solid fuels to generate electricity and provide household heating, and as materials to produce bio-char, bio-diesel, bio-ethanol, etc. At present, problems with the crop straw pelletizing process mainly include high energy consumption, short die life, and low product heating value (Holm et al. 2006; Saidur et al. 2011; Xia et al. 2014). Extensive research has been carried out to find solutions to these problems. These solutions can be divided into three approaches: optimal design for the technological parameters, pre-treatment of the raw material, and the use of additives. The first method is the optimal design for the technological parameters such as material type, moisture content, particle size and its distribution, temperature, pressure, compression speed, and mold size (Kaliyan and Morey 2009; Zhang et al. 2014). 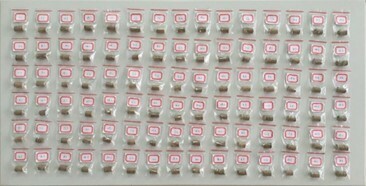 The related research is always conducted with a single pellet unit based on experiments. With optimization targets such as the lowest specific energy consumption, the highest density, tensile strength, and mechanical durability, optimal conditions for the pelletizing process of each type of biomass materials are obtained from variance analysis and regression analysis of the experimental data (Samuelsson et al. 2012; Rudolfsson et al. 2015; Guo et al. 2016; Mandal et al. 2018). This method is easily handled. However, because of the low heating value and high pelletizing energy consumption of the raw materials, the effects of this method are limited. Therefore, some researchers are investigating ways to improve the raw material pelletizing properties. The second method is pretreatment of the raw material to change or destroy the stable molecular structure and increase the carbon content in the raw material. The goal of pretreatment is to improve the grindability and the higher heating value of the biomass (Chen and Kuo 2010; Phanphanich and Mani 2011). At present, pretreatment methods mainly include torrefaction, hydrothermal carbonization, and biological pretreatment (Poucke et al. 2016; Rudolfsson et al. 2017; Gao et al. 2017). This method has significant effects on the improvement of biomass pelletizing process, especially on the improvement of the product heating value (Poucke et al. 2016; Martín-Lara et al. 2017; Manouchehrinejad and Mani 2018). However, the process is complex. The third method involves the use of additives. Researchers mainly have focused on finding reasonable additives and investigating the pelletizing properties of the mixture. The additives can be fossil fuels such as coal (Narra et al. 2010), biomass such as sawdust and sugar (Larsson et al. 2015; Ståhl et al. 2016; Rahaman and Salam 2017), polymers such as polyethylene (Emadi et al. 2018), etc. Different effects such as higher heating value, higher strength, lower ash content, and lower energy consumption can be achieved by adding in different additives. With low costs and good effects, the use of additives is a potential method to improve the pelletizing process. On a global basis, nearly 24 million metric tons of environmentally hazardous waste engine oil are generated each year (Lam et al. 2015). The recycling of the waste engine oil has attracted lots of attention (Arpa et al. 2010). Normally, the price of the waste engine is within 0.5 to 1 USD/gal in the USA, India, and China. With a high heating value, good lubrication, and low price, waste engine oil can potentially be used as an additive to improve the pelletizing process. However, the use of the waste engine oil additive in biomass pelletizing processes has not been reported yet. In this paper, the effects of waste engine oil additives on the wheat straw pelletizing process was investigated. Experiments were conducted based on a Central Composite Design, and the factor levels were chosen based on published works and real production processes. Thermogravimetric (TG) experiments were carried out first by blending raw materials with different amounts of waste engine oil. Based on these experiments, the kinetic parameters of each pyrolysis process were calculated, and the influence of the additive contents on pyrolysis properties was obtained. The rest of the experiments were carried out with a self-designed single pellet unit. By considering the interaction between the additive content and other factors (moisture content, temperature, and pressure), the effects of additive content on specific energy consumption, pellet density, tensile strength, and higher heating value were investigated. Finally, a comparison between the effects of waste engine oil additives and the additives used in published works was made. The wheat straw used in this study was collected in Yangzhou, China, in June 2017. The raw materials were naturally air-dried from 9:00 a.m. to 4:00 p.m. for two days, and then kept in plastic sealed bags before use. The waste engine oil (API SN SAE 5W-40, Exxon Mobil Corporation, USA) was filtered with cotton gauzes before use. Before the experiment, the wheat straw was crushed into particles with a lab-scale crusher, and the particle size distribution was tested based on ANSI/ASAE S319.4 (2012). The geometric mean diameter (dgw) of the crushed material was 0.49 mm. The initial moisture content of the crushed wheat straw was tested with a moisture analyzer (SH10A, Jinghua Instruments, Shanghai, China), and was measured to be 5% ± 1%. Based on the moisture content levels shown in Table 1 and the test scheme shown in Table 2, the test materials for each trial were prepared by adding water and waste engine oil with the help of an electronic analytical balance (JJ224BC, G&G Measurement Plant, Changzhou, China). The wheat straw and the liquid were put into a beaker and mixed with a glass rod. Three copies of the test materials were prepared for each trial and then kept in separate tagged sealed plastic bags. The prepared test materials were kept in a cool place for 24 hours under the temperature within 22 °C to 27 °C before use. An apparatus including a single pellet unit and a universal testing machine was developed for use in previous studies (Wang et al. 2016; 2017; 2018). This device can be used to produce densified biomass pellets with different types of raw materials under different technological parameters. In this study, the diameter of the die hole was 10 mm; compression velocity was 20 mm/min; the weight of the raw material during one compression process was 2 g.
The experiments were carried out based on a Central Composite Design (CCD). There were three duplications for each trial, and the average value of each three duplications was taken as the final result. 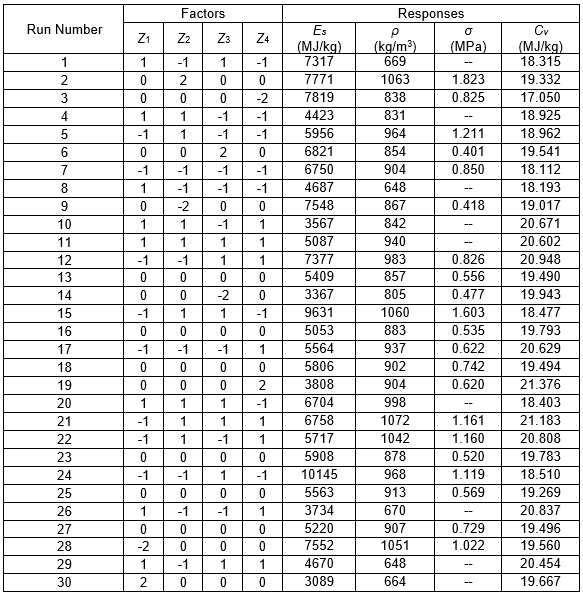 The level codes of each factor are shown in Table 1, and the test scheme is shown in Table 2. In Table 1, . Five samples were taken from the crushed wheat straw, and each weighed 5 ± 0.1 g. Based on the additive content levels in Table 1, different amounts of waste engine oil were added to each sample. The five mixtures were kept in five sealed bags respectively after they were well mixed. The five prepared samples were kept in a cool place for at least 24 hours, and the test materials for TG analysis were finally prepared. The TG experiments were carried out with a TG analyzer (TGA/SDTA851E, Mettler Toledo, Zurich, Switzerland) at a linear heating with a heating rate of 20 °C/min under the atmosphere of air, from 50 °C to 600 °C, and the weight change of each sample was recorded. Based on the relationship between sample weight and temperature, the TG curve and derivative thermogravimetric (DTG) curve were obtained. Furthermore, kinetic parameters for each of the five samples were calculated, and the effects of additive content on the pyrolysis of wheat straw were obtained. where Es is the specific energy consumption (MJ/kg), D is the mold diameter (m), m is the pellet weight (g), L is the maximum displacement of pressing shaft (m), and x is the displacement (m). where ρ is the pellet density (kg/m3); m is the pellet weight (kg); d is the pellet diameter (m); l is the pellet length (m). where σ is the tensile strength (MPa), F is the load at fracture (N), d is the pellet diameter (mm), and l is the pellet length (mm). The pellets made in the experiments are shown in Fig. 1, and test results are shown in Table 2. Based on the data in Table 2, the specific energy consumption, density, tensile strength, and higher heating value are analyzed in the following sections. The TG curves and related DTG curves obtained from the experiments are plotted in Fig. 2. The temperature corresponding to each point IG is the ignition temperature for each material (Wang et al. 2009). Points A, B, C, and D are inflection points and peaks of the DTG curves. These points indicate the change of the mass loss rate of the sample. 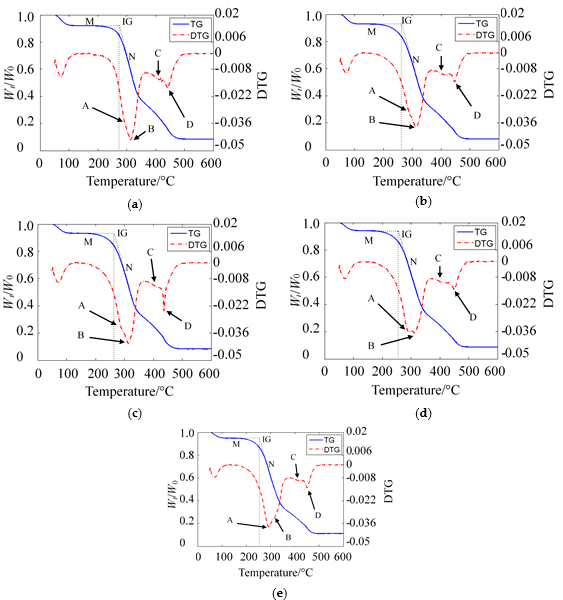 Points A, B, C, and D correspond to the pyrolysis of hemicellulose, cellulose, lignin, and charcoal, respectively (Chen and Kuo 2010; Lajili et al. 2014). The temperatures of these points are shown in Table 3. Figure 2 and Table 3 show that the additive contents did not affect the temperature at which each component decomposed. The average decomposition temperatures of hemicellulose, cellulose, lignin, and charcoal were 292.3 °C, 313.7 °C, 415.8 °C, and 445.0 °C, respectively. The ignition temperature decreased with increasing additive content, but the decreasing rate slowed down gradually, as shown in Fig. 3. Figure 2 shows that increasing additive contents did not change the shape of the TG curve and DTG curve. However, compared with point B, the mass loss rate at point A increased with increasing additive content. Therefore, the waste engine oil decomposed at the temperature of point A, which was in accordance with that of hemicellulose. Previous research has proved that the pyrolysis process of biomass materials is a first-order reaction and can be expressed as Eq. 4 (Chen and Kuo 2010; Gil et al. 2010; Jeguirim et al. 2014; Oyedun et al. 2014; Li et al. 2016; Maia and Morais 2016; Pan et al. 2016). where W0 is the initial sample weight (g), Wt is the current sample weight (g), and Wf is the final sample weight (g). Therefore, Ea and A can be obtained by plotting Y versus X. Plots of Y against X for five samples are shown in Fig. 4 (Wang et al. 2009; Gil et al. 2010; Maia and Morais 2016; Mishra and Mohanty 2018). Figure 4 shows that all five pyrolysis processes could be divided into three stages and could be expressed by three first-order reactions. Combined with the temperature for several special points listed in Table 3, the three stages included: Stage 1, volatiles, decomposition of hemicellulose, waste engine oil, and cellulose (volatiles, and readily combustion parts of char); Stage 2, decomposition of lignin (readily combustion parts of char); Stage 3, combustion of charcoal (not readily combustion parts of char) (Gil et al. 2010; Lajili et al. 2014). 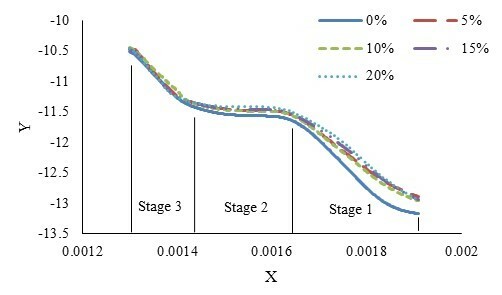 Linear fitting was performed for each stage of the five samples. Based on the results of fitting, the mean activation energy and the pre-exponential factor were obtained. The fitted equations of different stages and related kinetic parameters for the five samples are presented in Table 4. From the calculated results listed in Table 4, no obvious monotonous relationship was observed between the additive content and both the mean activation energy and pre-exponential factor. The results of the specific energy consumption shown in Table 2 were processed by variance analysis. A quadratic model was a good fit for the data. The regression equation is expressed as Eq. 10 with significant terms. For this equation, the regression factor R2 was equal to 0.9732, which suggested that Eq. 10 can provide good predictions. The F test indicated that Eq. 10 is highly statistically significant (p < 0.0001). The lack of fit value was equal to 0.5365, which meant that Eq. 10 fits well with the experimental data. where Es is the specific energy consumption (MJ/kg); Z1, Z2, Z3, and Z4 represented moisture content, temperature, pressure, and additive content, respectively. Equation 10 showed that the specific energy consumption decreased first and then increased with the increase of temperature, reaching the minimum when the temperature level was 0.07. 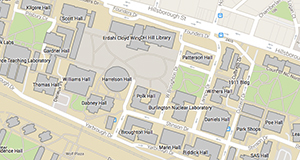 This behavior was in accordance with the results of previous research (Wang et al. 2017). There were significant interactions between the pressure and the additive content. In order to investigate the influence of additive content on the specific energy consumption, the partial derivative of specific energy consumption with respect to Z4 was shown as Eq. 11.
where, CEs1=-880-420Z3, and CEs2 is the integral constant. Based on Eq. 12, the specific energy consumption is plotted in Fig. 5 with the abscissa of Z4, and the ordinate of CEs1. In the biomass pelletizing process, most of the energy is used to overcome the friction between the materials and the die wall. This high friction is also one of the reasons for the die’s short lifespan. Moisture in raw materials is the natural lubricant in the biomass pelletizing process which can reduce the friction and thus reduce energy consumption (Hu et al. 2013). However, moisture content should be controlled within a reasonable range to ensure product quality. With good lubrication properties, additional waste engine oil additives can achieve better effects. Figure 5 shows that the specific energy consumption decreased with increasing additive content. This phenomenon was more significant with a high compression pressure (corresponding to a small CEs1). However, the additive content had few effects on the specific energy consumption under a low compression pressure. This is different than the effect of moisture content (Wang et al. 2017). In real production processes, enough compressive pressure (normally no less than 30 MPa) is needed to ensure the product’s mechanical properties are acceptable. Thus, the addition of the waste engine oil to the pelletizing process is a considerable way to reduce energy consumption. The data of pellet density were processed by variance analysis and some insignificant terms were ignored. Results showed that a quadratic model was a good fit for the data. The regression equation is expressed as Eq. 13 with significant terms. For this equation, the regression factor R2 equals 0.9471, which suggested that Eq. 13 can provide good predictions. The F test indicated that Eq. 13 is highly statistically significant (p < 0.0001). The lack of fit value equals 0.1253, which meant that Eq. 13 fits well with the experimental data. where ρ is pellet density (kg/m3); Z1, Z2, and Z3 represent moisture content, temperature, and pressure, respectively. As shown in Table 2, the range of pellet density in this study is within 648 kg/m3 and 1072 kg/m3, which is in accordance with other research (Xia et al. 2016; Stasiak et al. 2017). It can be seen from Eq. 13 that the effects of additive content on pellet density can be ignored. Therefore, waste engine oil cannot improve pellet density in the manner that many other binders such as starch and sugar are able to (Narra et al. 2010; Larsson et al. 2015; Ståhl et al. 2016). Meanwhile, it also does not lead to a decrease in pellet density like other oily additives such as rapeseed cake (Ståhl and Berghel 2011). 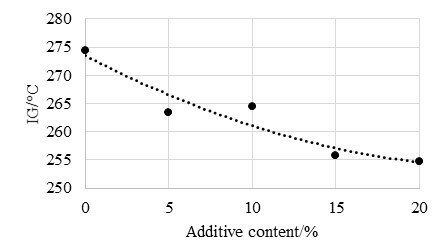 Furthermore, the additive content does not change the influence of other factors on pellet density. During the experiment, there were obvious cracks in the produced pellets when the moisture content was no less than 20%. Normally, the optimal moisture content for the biomass pelletizing process is between 11% and 15% (Mani et al. 2006; Samuelsson et al. 2012; Guo et al. 2016). Thus, the tensile strength of these pellets was not included in Table 2. Therefore, . The data were processed by variance analysis, and the regression equation is expressed as Eq. 14 with significant terms. For this equation, the regression factor R2 was equal to 0.9479, which suggested that Eq. 14 can provide good predictions. The F test indicated that Eq. 14 is highly statistically significant (p < 0.0001). The lack of fit value was equal to 0.2783, which meant Eq. 14 fit well with the experimental data. where σ is the tensile strength (MPa); Z1, Z2, Z3, and Z4 represented moisture content, temperature, pressure, and additive content, respectively. In order to investigate the influence of additive content on the tensile strength, the partial derivative of the tensile strength with respect to Z4 was shown in Eq. 15.
where Cσ1=-0.051+0.075Z1 , and Cσ2 is the integral constant. Based on Eq. 16, the tensile strength is plotted in Fig. 6 with the abscissa of Z4, and the ordinate of Cσ1. As shown in Fig. 6, the addition of waste engine oil brought a decrease in tensile strength. The maximum decreasing amplitude was approximately 0.8 MPa. There were significant interactions between additive content and moisture content. The influence of additives on the tensile strength was more significant at lower moisture contents. The effects of waste engine oil on the tensile strength are similar to that of rapeseed cake (Ståhl and Berghel 2011). The effects of natural binders (lignin and cellulosic) and mechanical connections in pellets are weakened. Therefore, waste engine oil cannot act as a binder to improve the tensile strength. Extra binders such as starch and microalgae may be more beneficial (Muazu and Stegemann 2017). where Cv is the HHV of the mixture (MJ/kg), Z2 is the code of temperature, and Z4 is the code of additive content. where Cvm is the HHV of the raw material mixture (MJ/kg), Cvs is the HHV of the wheat straw (MJ/kg), and Cvo is the HHV of the waste engine oil (MJ/kg). where C’vm is the pellet higher heating value (MJ/kg). Therefore, the HHV of the wheat straw and wasted engine oil used in this experiment were 17.32 MJ/kg and 39.72 MJ/kg, respectively. Some studies have focused on finding additives to improve the biomass pelletizing process. These additives can be divided into four types, including fossil additives, oxides, biomass materials, and artificial organics. The effects of these different additives vary. The first two types of additives can only achieve single effects on the pelletizing process and do not affect energy consumption. Fossil additives such as coal can only increase the pellet heating value (Narra et al. 2010). Oxides such as calcium and magnesium oxides can only help to prevent the corrosion of heaters (Aho et al. 2008). Commonly used biomass additives include biomass materials rich in lignin, starch, or sugar, such as cassava stem powder, molasses, sawdust, bamboo, (Liu et al. 2013; Larsson et al. 2015; Ståhl et al. 2016; Rahaman and Salam 2017; Avedi et al. 2018) etc. The use of biomass additives is in accordance with the goal of using the energy in biomass resources. The pellet strength and density can be increased, and the energy consumption can be decreased. Nevertheless, the reduction in energy consumption is not as significant as when waste engine oil is used. Additionally, biomass additives have little effect on the pellet heating value. Waste engine oil is a type of artificial organic additive. In this study, the waste engine oil was recycled as an additive in wheat straw pelletizing process. Recent studies have also focused on other kinds of artificial organic additives. Mišljenović et al. (2015) added waste vegetable oil in spruce pellets and found that the energy value was improved. Emadi et al. (2018) used plastic wastes as additives in the pelletizing process of wheat straw and barley straw. The results showed that the higher heating value and tensile strength were increased. Cheng et al. (2018) included the hazardous waste material coal tar residue in biomass pelletizing process. The results showed that the products presented a high viscosity and higher heating value. These additives have similar effects on the improvement of energy consumption and pellet higher heating value. However, including the waste engine oil led to a decrease in the pellet tensile strength. Thus, a combination of the waste engine oil and biomass additives could have considerable results. However, because the waste engine oil is environmentally hazardous, the pellets made from the mixture should not be used for household heating or cooking. Instead, they should be handled with specific machines and professionals. The mixed pellets can be further processed by pyrolysis to produce fuels such as gases, oil, and char (Mahinpey et al. 2009; Lam et al. 2016). The amount of waste oil should be controlled, and the suggested value is less than 5% (Mišljenović et al. 2015). Further research should pay attention to the emission of the mixed pellets (Kraiem et al. 2016). In this study, the effects of waste engine oil additives on the wheat straw pelletizing process were investigated based on TG analysis and the four-factor central composite experimental design technique. The effects of additive content on pyrolysis properties, specific energy consumption, pellet density, tensile strength, and heating value were obtained. Heating values of the wheat straw and waste engine oil used in this study were 17.3 MJ/kg and 39.7 MJ/kg, respectively. Pyrolysis processes of wheat straw and its mixture with waste engine oil could be described by three first-order reactions. The use of waste engine oil additives had few effects on pellet density, but increased the pellet heating value, and decreased the ignition temperature, specific energy consumption, and tensile strength. Waste engine oil is a potential additive to reduce energy consumption and improve pellet heating value for the wheat straw pelletizing process. However, it cannot act as a binder to improve pellet density and tensile strength. A mixture of waste engine oil and extra binders, such as starch powder, may achieve better results as an additive. ANSI/ASAE S319.4 (2012). “Method of determining and expressing fineness of feed materials by sieving,” American Society of Agricultural and Biological Engineers, Michigan, USA. Hu, J., Lei, T., Shen, S., and Zhang, Q. (2013). “Specific energy consumption regression and process parameters optimization in wet-briquetting of rice straw at normal temperature,” BioResources 8(1), 663-675. DOI: 10.15376/biores.8.1.663-675. Wang, Y., Sun, Y., Wu, K., and Xia, X. (2016). “Optimal design for rice straw briquetting process based on experiments,” in: International Design Engineering Technical Conferences and Computers and Information in Engineering Conference: ASME 2016, Charlotte, USA, pp. V02AT03A047. Article submitted: August 8, 2018; Peer review completed: October 28, 2018; Revised version received: November 21, 2018; Accepted: November 22, 2018; Published: November 28, 2018.